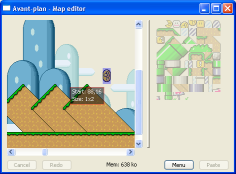 GBA Graphics is a graphic converter for GBA and DS, and a powerful universal map editor for 2D projects. It's very complete and should be enough for some projects, like some platformers. It will spare you a lot of code to type, and provides a scripting system so you can customize it if you want. The interface is also intuitive and provides powerful features such as object lists, multi-map editing with parallax scrolling, emulation of mirror and palette bits, resize from scratch, cut n' paste, undo/redo, etc. Its use is recommended for OSLib and �Library maps. The source has changed a lot though, because it is now using real .cpp/.h files instead of multiple .h files. The plugin API has changed a bit. Separate compilation should make it easier to code your own plugins. 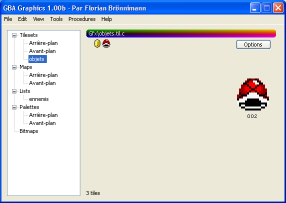 This is an old version of GBA Graphics.